Hot ham and cheese sandwich casserole is the perfect savory recipe to feed a crowd on game day, for a holiday, or just because! Who doesn’t need good party recipes now and again, right? When hosting a larger gathering, I normally find myself gravitating to things like no bean pork chili or baked ziti as easy-to-make crowd-pleasers. 1. Everything’s made all in one pan. (Or two or three, depending on how many you need.) I like to use disposable deep-dish baking trays like these, so that when the party’s over I have fewer dishes to wash. If you’re the type who doesn’t mind a couple extra pans in sink, or you have beautiful casserole dishes you’d like to show off, then by all means use those! 2. You. Can. Make. Them. Ahead. This is genius when it comes to enjoying a party you’re hosting. Prep them the day before, throw them into the fridge, and then an hour or so before the party starts go ahead and bake them. These suckers are delicious hot out of the oven, and they’re also good at room temp, which means you don’t have to be precise with your timing. 3. The recipe is super flexible! That said, if your grocery store doesn’t carry King’s Hawaiian, either buy them in advance here … gosh, how I love Amazon…, or use party potato rolls instead. And, if you’re not a fan of the ham and cheese combo, or want a little variety, use something else: roast beef and provolone, turkey and gruyere, mushrooms and swisse. Hot Ham and Cheese Casserole is a favorite party food! Slice the King’s Hawaiian rolls in half. Line the bottom of a 9X13" baking pan with the bottom halves of the rolls (they should just fit). Spread the half the ham over the rolls, and then layer half the the Swiss cheese on top. Repeat the ham and cheese layers. Place the other halves of the rolls on top, press them down gently. Set aside. In a small sauce pan, combine the butter, mustard, Worcestershire sauce, and dried onions. Over medium heat, stir until the butter has melted to create the sauce. 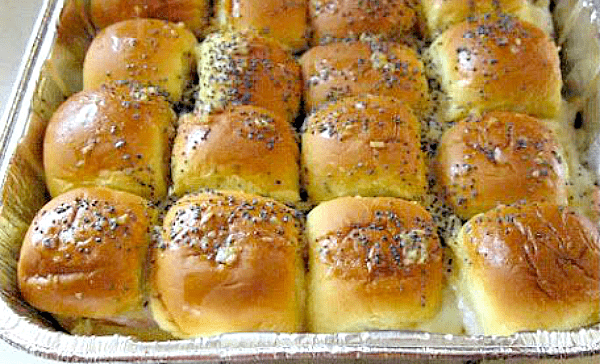 Pour the sauce over top of the rolls, and then sprinkle the tops with the poppy seeds. Cover the pans tightly with aluminum foil, and then refrigerate for at least three hours or overnight (better). Place the covered baking dishes in the oven for 20 minutes. Uncover and bake for an additional 5 minutes, or until the cheese has finished melting. Serve warm or at room temperature. Makes 24 mini sandwiches. That’s ironic, Judith! Is your Missy in Maryland? No, In Nashville TN! They have a tent for tailgating at EVERY Vanderbilt Football and Baseball game since 1998! I am so happy that you posted a similar recipe and that I found your great blog :). Wow – that’s impressive! My in-laws tailgated at Univ. of MD football games for nearly 20 years. I hope you like this recipe, and I’m glad you found the blog too! Suggestions for keeping warm if taking to another location/? Hi Ellen! If you’d have access to the oven at the other location, I’d wait and do the baking there. Otherwise, next best idea would be to bake it at home, then tote it in an insulated casserole bag with a warming pack on top. If you don’t have one of those, then I’d wrap the casserole in foil, then towels, and then bring it in a box/bag. Good news is, while these sandwiches are best served hot, they also taste good warm/room temp. Enjoy! Wrap in foil and pace in insulated container that contains heat. Once baked, do you break apart and eat with fingers, or does the bread get soggy and need a plate/fork? Hi Amy! So, if you’re eating it right out of the oven, it shouldn’t be so soggy that it needs a knife and fork, but it might drip a little (in a good way!). But, if you’re baking it and then transporting it, there’s a chance the bread could get a little soggy. When I make it, we just break it apart and eat it with our fingers. Thanks. I’ve made something much like this, but the sandwiches are individually wrapped in foil, then baked. This seems much easier. Yum! Hi Candice! Absolutely – just take into account that onion powder is a more concentrated flavor, so the ratio may not be the same as onion dried onions. Maybe 1 teaspoon of onion powder is what I’d try…. Let me know how it turns out! Do you really fit 24 in a 9×11 pan? I bought everything to make these tomorrow and the pan seems way too small for 24? Also, only 1 lb of ham for 48 sands? I got 1 1/2 and it doesn’t seem like enough. Thanks! Hi Amy! Yes, 24 fit into a 9×11″ pan (as pictured), but you have to buy the small rolls. Not regular sized rolls. And it’s supposed to be a thin layer of ham, but you can certainly make it as thick as you want. These are intended to be appetizers, but you can definitely make a meal out of them! Hope that helps! Hi – great question! I’d use portobello mushrooms in place of the meat if it was me! Portobello definitely. Also, if you high heat roast thin slices of summer sq. Zucchini seems to mush out but summer sq gets carmelization, yum! Brush them a BIT of olive oil and season well. Eggplant, to me, gets too soft. Maybe a stack of roasted summer sq, roasted fennel and sweet onion. Provolone cheese or shaved Asiago? Endless possibilities. Another option is to purchase Tofurkey brand deli slices instead of ham. These can be found in the produce section of most grocery stores including Publix, Kroger, Trader Joes and Ingles. what happened to the Pepperidge Farm rolls, the 20 in a pack. I used these but I can’t find them anywhere, not even on their website. Were they discontinued? This is really making my holidays a lot harder! Huh. I don’t know, Cheryl! I’d use the King’s Hawaiian or the small potato rolls instead! Don’t you just love the versatility, Tammy? I’ve never used those – it’s worth trying if you already have them on hand! Don’t you need 48 slices cheese? 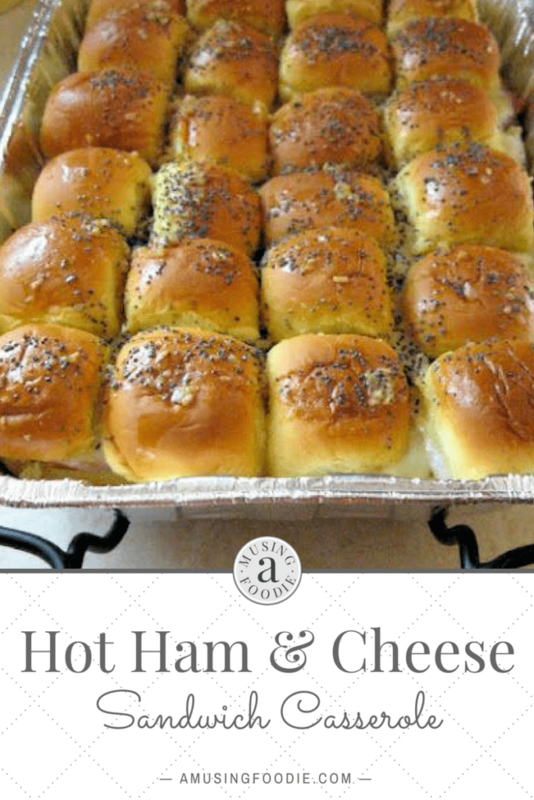 I am going to try half as the recipe states and half with potato rolls and cheddar (picky eaters), with doubling or tripling the ham to make it a main for our Superbowl party! I’m excited! They look so good! Hey these look great! I’m having a party I would love to serve these at. I will do the ham, but don’t like Swiss…why do you think would be a good alternative? Cheddar? American? Also want another meat option since this will be our main dish. Roast beef? Turkey? What does everyone think? Thanks! Hi Nicole! Hmmm… I think roast beef & cheddar would be an excellent combo! As for another pairing with the ham, how about provolone or muenster? They sound fabulous! if I can’t find the mini Hawaiian rolls, how would I change recipe to accomodate reg sized Hawaiian rolls? Hi Karen – If you can’t find the mini Hawaiian rolls, you can use mini potato rolls. If you use the larger sized Hawaiian rolls, nothing really changes with the recipe, except knowing how many to buy to fit in the pan. 😉 Good luck! Yeah I couldn’t find the small Hawaiian rolls either. So I bought another small type roll to use instead. Plus I couldn’t find regular Dijon mustard. So I’m using honey Dijon. Making them tonight. Hopefully they will turn out good. I think the honey Dijon mustard will be AWESOME! Let me know how they turn out! I had been scouring the net for a dish “for a crowd” and kept coming back to this recipe. I’m making this recipe for a gathering in 2 weeks. I going to do your traditional recipe with ham an cheese and then since it’s a St Paddy Party, I’m going to do another batch with corned beef (from the deli) and swiss cheese.. 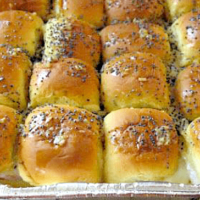 Instead of poppy seeds on top of the sliders, I’m thinking caraway seeds. I’ll let you all know how it turned out. Excellent! Thanks for stopping by, Jennifer! Do ou think these would be appropriate to serve at a women’s luncheon?? They’re not as delicate as some luncheon food, but I’d serve them! And did I mention…My friends wanted to know who invented this…they deserve an award! I’m making a batch tomorrow for a friend. I found my rolls in Target. So nice not to have to get them thru Amazon. I could eat a whole tray of these mini globs of cheesy ham delights. Are they still good leftover? Jess – They’re not as good (although cooked and eaten room temp is yummy), but certainly fine to eat. I’d worry about the bread getting stale around the edges if you wait too long to eat the leftovers. Patty – that’s a great question! I’ve never done that, but I’m not sure it would hurt anything. You could always freeze them before cooking and thaw them out in the fridge overnight when you’re ready to cook. If you try it, let me know how it turns out! he froze them and then cooked. Still DELISH! These are great with the ham but I have a couple of people who do not eat ham. If I use turkey what cheese would you suggest? I saw the corned beef idea and like that, any other ideas? Janet – I think roast beef and cheddar or Provolone would be fantastic! Found this recipe on pinterest a little over a year ago and our family loves them! We make them for all the special family get togethers and parties. Never heard anyone say they didn’t like them. So simple and super easy to make plus super yummy. I was looking at this recipe and really wanted to make it for a small pot luck tonight, I’m not sure I have time to refrigerate them. Would they still turn out okay? Hi Lyndsey! As long as you give them a little time to sit before you bake them, I think they’d be fine. Letting them rest in the fridge for a few hours (or overnight) is ideal because the flavors really meld together, but it’s not critical. My guess is that they’ll still taste gooey and delicious. Let me know how it turns out! I made these for a family event and everyone loved them! Hi Kathleen! I’m not sure what homemade hops are, but yes – you can play around with the type of roll. You want something soft, which is why a potato roll or the King’s Hawaiian rolls are recommended. Let me know how yours turn out and what you end up using! What sides should you serve or what would go well with these sandwiches? Kara – I’ve made creamy potato salad as a side with salad and chips. Baked beans would be yummy too! Great recipe! I made these for a work potluck. Luckily we have an oven that can be used at work, so I made the night before cooked them at work. Followed the recipe exactly and they came out perfect. Everyone really liked them – the Dijon gives them a good taste, they weren’t greasy and were easy to eat. I was thinking about playing around with different meats and cheeses but they are perfect the way they are! Michelle – there’s no need to line the pan unless you want to. It won’t hurt anything either way. Made these today and they were excellent! In fact, I just microwaved some leftovers to have for a snack and they were just as good reheated! Will definitely make these again! Shannon – thanks for coming back to report! I’m so glad! Mmm…. This recipe looks so yummy – planning to make these for my son’s 2nd birthday party – two quick questions – did you bake each of your dishes of 24 separately or in the oven at the same time? And for the dried onions is that the same as McCormick’s Minced Onions? Or am looking for something different? Thank you – looking forward to trying these! Hi Kim! Yes, I baked both trays at the same time. And yes, minced onions are the same as dried onions! 🙂 Hope you enjoy! Theresa – so you used double sauce on a pan of rolls, and it still seemed like not enough? LOL! It’s not supposed to be swimming in it (although I can’t imagine going drastically wrong using TOO much better…but it might be a lot greasier). Let me know how it turns out! I made these this evening & really wasn’t pleased. I baked them longer than directed just to soak up the butter sauce. I finally took them out of the pan & continued baking them on a piece of foil. Then I blotted them with two sets of paper towels. That being said I did get compliments on them. If I ever try this again, I will most definitely cut the sauce in half. Maybe a personal taste thing, but just way too greasy for me. Eleanor – interesting! I’ve feedback in the other direction too, that there isn’t enough sauce. Did you make two trays of the sandwiches? No, just one tray of 12 rolls. Used just 1/2 cup of butter for the sauce. As I said, may just be a personal preference. Thank you for your reply. I am making these for a baby shower on Saturday. I thought about baking them in a roaster oven so I can serve them hot. Do you know how long I should roast them or even if this would work? Angie – a “roaster” oven? Is that like a toaster oven? If so, that could work if it holds enough, and if the temp gets high enough. You might want to watch closely to be sure the tops don’t burn if they’re close to the top of the oven. You can also bake them at home (maybe not quite all the way), and then reheat them at the shower. Is there another name for those rolls? I’ve never heard of them here (Canada). silly question but when spreading the ham over the rolls, am i cutting each piece of ham to fit in the rolls or do i have to cut and separate the rolls after they are baked? when you pull them apart will the ham just rip?? My neighbor made these.. we all went crazy over them but i don’t remember having a probably getting them out of the pan. Hi Kathleen! I usually pull the ham apart and put it in little bundles on each roll – nothing fancy or orderly. I also leave the rolls together, so they kind of pull apart, but you also might find it’s easier to use a knife to cut them first. Not much help – sorry! Point is: they’re forgiving. 🙂 Hope you love them as much as when your neighbor made them! do you try to keep the ham on each individual roll or just spread it around and then cut in between each sandwich? sorry just saw the answer to my question!!! I looked all over see no word on greasing pan is it necessary ?? Hi Paulette – I do NOT grease the pan. The sauce helps to keep things from getting stuck; I’ve never had a problem! Hi! I’ve been looking at this recipe for months and can’t wait to make it for our big game Sunday night! All the reviews are awesome. My question is. ..I actually despise mustard, is it a strong mustard taste? Can I substitute or maybe just use less? ? Eveything else sounds great:-) any thoughts? Hi Sheila! Since the mustard is cooked in a sauce with the Worcestershire, I do NOT think there’s a strong mustard taste. Dijon isn’t terribly strong or spicy, but you could use a honey mustard instead if you think the sweetness would be better. It’s only a couple teaspoons in the sauce that’s going over top the WHOLE tray of sandwiches, so it’s not the same taste as if it was slathered on the buns or something. Let me know what you end up trying! How crucial is the refrigeration part? Wanting to make these right now! It definitely helps things soak in better, but I’d say it’s not super critical. If you can let them rest 30-60 minutes in the fridge first, that’d probably be good! I bought all the ingredients. I’m making this tonight! Can I make these 2 days in advance? Also my local store didn’t have Hawaiian bun I bought frozen rhodes dinner rolls would you suggest baking the rolls then go on with the recipe? Hi Val! Yes, you can put it together two days in advance (gives those flavors more time to meld). And, it’s good with other rolls – but, definitely bake them first! You don’t want to use raw dough for this. I’ve made this recipe multiple times over the last year and my family loves them!! It’s so quick and easy and so delicious. I’ve made it using only 24 rolls and the whole amount of sauce. The only thing I don’t use is the poppy seeds. . It is wonderful, they do come out “greasy” but to me that’s just part of what makes it so good!! I’ve let them sit over night and baked them the next night. I’ve also baked them right after I assemble and it turns out the same every time! I get full off of 2 of these little guys and that’s without any side dishes! I don’t think it has a strong mustard flavor, I think everything just mends together and it’s just perfection!! Thanks so much! Terrific! PS: You’ll have to let me know how they work as a freezer meal! I catered my mother’s 70th bday party and made these awesome sandwiches. I used the Hawaiian Mini Sub Roll, and used ham with some American and some Swiss cheese, turkey/Colby, roast beef with some pepper jack and some Swiss. They were a huge hit and easy to fit with anything else prepared. I continue to make them for family and friends. And you are right. These are even good at room temp. Oooh – I bet the pepper jack gave a great kick! What do you think of using cheese only? Looking for an idea for a meatless Friday. Thanks. I think they’d taste good, but would be missing something. Wonder if there’s a meatless option you could add in, like mushrooms or peppers, to give them a little more of a bite? What do you think about tuna and cheese? I don’t generally like mixing fish and cheese. BUT, I do like tuna melts…so it *could* be okay! We LOVE these! My boyfriend can’t get enough, although I’ve alerted them slightly because I can’t do mustard. Instead I use a little mayo on the bun and add just a dollop of honey mustard in the sauce. I’ve also used several different lunch meats and cheese. Our favorite is with turkey and alternating the cheese on each row with swiss, Colby and pepper jack. You still get a little sweet taste because of the Hawaiian roll. So yummy! I made these for a work party for our MOPS workers and they were a big hit! Then used the leftovers to send with my hungry hunters and they loved them – even cold the next day. Yummy recipe! My MIL is going to make them for a men’s luncheon at church. Hi Deb – that’s great!!! Love the wooden handle serving dish. Where can I get one? Please!!! Love the recipe of course as well. Goes without saying. The casserole holder? I got that YEARS ago, like over a decade ago, from one of those in-home MLM housewares brands. I can’t remember now what the name of it was! I’m wondering if you’ve ever tried making these ahead and freezing them.?? I have not, but I’m sure you could do it — either before or after baking! If you bake them first, I’d let them cool completely before freezing. Would it work to bake and take in slo cooker to keep warm? Or would they get soggy? Thanks in advance. I do think cooking the whole time in the slow cooker could make them soggy, but you could bake in the oven, and then transport via your slow cooker! recipe says 2 12-packs of rolls but several comments refer to making 48 sandwiches. The stick and a half of butter – is that for one pan of 24 or 2 pans of 24? Hi Toni! The original recipe was for two pans of 24, which is why you probably noticed comments suggesting 48 sandwiches. If you need 48, just double the current instructions and you’ll be good to go. The recipe on the Kings Hawaiian website calls for 1/2 cup butter. Yours is 1 1/2 sticks. Do you think the extra 1/2 stick is better? Hi Pam! Good question. I like it with the 1-1/2 sticks, and haven’t tried it with less. Give it a go if you want! These are wonderful! I didn’t have ham and Swiss, so we substituted turkey and Colby Jack cheese. Everyone loved them. Next time, I’ll do 12 of each. I’m thinking of serving these at a graduation party (not at my home) for 100-150 guests. Do you think it would work to bake them at home in advance and warm them up in a roaster oven (which would require stacking)? Yes, I do! You may want to make them a little saucier than normal since you’ll be reheating — just to ensure they don’t dry out. Let me know how it goes if you try! Where did you get the iron pan holder? I LOVE it!! Hi! Oh gosh, I got that YEARS ago from one of those in-home party things. I can’t even remember the name! I bet something like HomeGoods would have it, or Williams Sonoma.